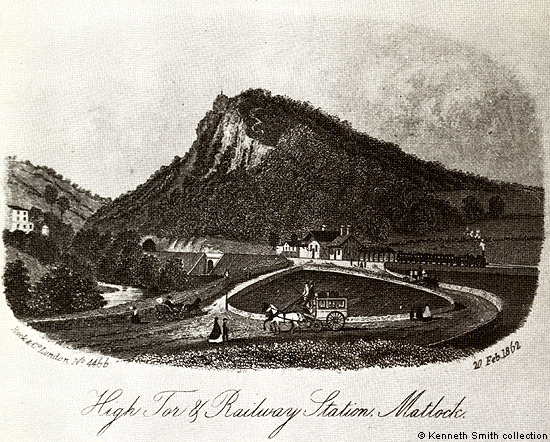 A vignette view of High Tor and Matlock Bath station, with its distinctive chalet-style roof. The engraved illustration was done for the London publishers Rock & Co. Ltd.; it is number 4466 and dated 20 Feb 1862. To the left of the station is the High Tor Tunnel. Between the tunnel and the station is a bridge under the line and a footpath connecting Matlock Bath and Starkholmes goes underneath. The white building on the left must be the old vicarage - a more obvious depiction of it can be seen elsewhere on this site. The station approach, for the carriages, curricles and phætons of the day, sweeps down to the left towards the recently built stone bridge that is just out of view. The iron footbridge bridge across the river Derwent, just past the bend, was not to be put in place for several more decades. View from the postcard of "High Tor & Railway Station, Matlock" published by Your Heritage (no date) in the collection of and provided by and © Ken Smith. Image scanned for this website and information written, researched by and © Ann Andrews. A vignette engraving is an engraved illustration that is not enclosed in a definite border and, as is the case here, the edge of the image might be either fuzzy or just fade into the background. 21] Rock & Co. was founded by William Frederick Rock. The firm specialised in, amongst other things, steel engraved vignette views. See image 3, High Tor Tunnel on Matlock Bath Today (4) where the building of the tunnel is discussed. There is a vignette engraving of High Tor Tunnel from "Bemroses' Guide" of 1869, showing the railway station building (at the bottom of the page). It is similar to this image and the former vicarage is shown. Also see the engraving from Mrs. Smedley's "Ladies' Manual".